Our plan here at Harpin Manor is to treat Ireland’s WRWC2017 matches the same way as we do Leinster & Ireland men throughout the season, only without the preview because I don’t want to even attempt to pretend I know more than I do about the women’s game, especially our opponents. But apart from that it will be business as usual for the coming weeks...I will tweet my thoughts throughout the matches, I will publish the thoughts of readers at full time [there was an excellent thread on Facebook for this match I thought], and finally I will offer my rambling opinions in a match writeup, of which this is meant to be one, so best crack on. One thing the Irish players both present and past have made clear is that they don’t want their performances treated with kid gloves. If they play badly, then it needs to be pointed out, unlike your son’s under 10s match on a Sunday morning when everyone is a winner. I am fully behind this approach and I am determined to hold the girl’s feet to the fire whenever I deem it necessary - though I would add a note of caution that it is possible to go too far in this regard. Still, this display from Tom Tierney’s side was nowhere near ideal. There were basic errors throughout, on a fundamental level like kicks not finding touch, simple dropped passes or, in the case of the first Australian try, falling asleep altogether, and also on general tactical levels, like taking the wrong option. What I noticed more than anything else was very laboured movement of passes through the backs - it wasn’t carried out with a view to advancing the ball beyond the gainline, it was more a case of making sure the passes themselves would stick and even then the ball would still find the turf. This needs to be addressed quickly, and assuming she recovers from her knock I'd like to see the Jenny Murphy crash ball option used a whole lot more. As you'll see in the next heading, we were making much better progress by carrying the ball through the forwards, so when it became apparent that the passing moves weren't clicking on the day I felt they should have been abandoned, with kicks for territory used as an option as well. There were several things the girls were doing that would have most coaches pulling their hair out but at the risk of falling into the 'kid gloves trap' I think the occasion needs to be taken into account. The Irish women's team have a habit of beating their male counterparts to big milestones like beating New Zealand, reaching a World Cup semifinal, and now they're actually hosting the showpiece itself. We can only imagine what it has been like in the build up to Wednesday's big kickoff with all the hype and the extra media attention, not to mention the devastating loss of talismanic skipper Niamh Briggs. Yes, there is a lot to work on before their next match on Sunday, but let's just say there's plenty of evidence that all the necessary tweaks can be made by then. First and foremost, the Irish pack. OK, maybe we coughed up a set piece or two, but more often than not we held our own - with Mary Louise Reilly a virtually unstoppable option in the lineout. And in open play we were magnificent; the Australians seemed to have absolutely no match for our pick and go and gains were made almost every time. I may not know too much about women's rugby but my eyebrow certainly raised when I saw Sophie Spence on the sub's bench, yet even without her the likes of skipper and absolute natural openside Claire Molloy, Ailis Egan and Lindsay Peat were able to keep the ball rolling. One thing that needs to be considered about tournaments like these is that with such short turnarounds between matches, squad management is key and you won't see all the best players selected all the time. And as this match turned out, the introduction of the powerful Spence [honourable mention for Ciara Griffin too] was exactly what Ireland needed to keep the ground game going, and it was she who got the winning try. Find faults with the Irish performance all you like but during the series of plays that led up to all three of our tries, our ball retention was nothing short of world class. Another thing we were good at was defence...yes, we fell asleep for the first try and for the other two we let them do to us in the forwards what we mostly did to them, but overall they found it tough to break us down, though going back to my point about our backs, the Wallaroos had a lot more creative tricks up their sleeves to get around us. Three things are certain in life - death, taxes, and Jenny Murphy getting a tackle in every time her opposition has the ball. Even when she didn't hit her first target before they released the ball she was able to regroup and bulldoze through a later receiver. It was a big blow to Ireland's chances when she went off but to be fair, her starting centre partner Sene Naoupu was also effective and hopefully the pair can be reunited. What I said earlier about 'taking the wrong option' needs to be clarified, because I thought we were superb at closing out the match. Spence's try gave us the comfort of a 9 point lead which was quickly taken away as our opponents marched down the other end and trimmed it to 2. A lot of teams would have started to have the heads drop at that point but not this Irish setup. 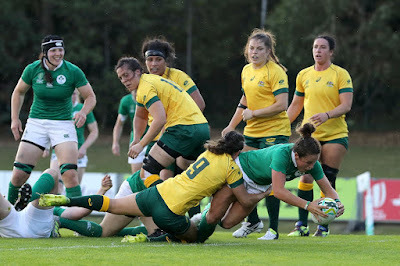 Nora Stapleton took a perfect restart grubbering it all the way to their 22 and she was ably backed up by her team-mates around the breakdown in ensuring the fired up Australians didn't produce a repeat performance of their third try. That ten-minute spell of classic 'cup rugby' is what gives me most confidence for Ireland's chances in this historic competition. Time to wear my green-tinted goggles with pride...I thought the ref's interpretation of the Aussie 3 impeding Maz Reilly's lifters was absolutely wrong and it should have been a yellow card, and on the first try, from the aptly-named Mahalia Murphy, I'm wondering if I'm the only one who thought the pass to her was forward? It was still a good finish to be fair. Another thing I'd say about them is that they were much more capable in the area of 'dark arts' around scrum and breakdown, though being a former prop I mean that as nothing but a compliment. Overall this was definitely a fine display overall from a side which the experts were saying came into this match as rank underdogs. And given they missed two very kickable conversions, we can consider ourselves fortunate to have ended up on top. The way this tournament is structured leaves you little room for error and Ireland must take this win and build on it. Next up is Japan, who got hockeyed by the French. It's important for us that we win well on Sunday, but equally so that we manage our players properly so we're ready for the matches beyond it. Of course in New Zealand and England there are much stronger opponents down the line but all Tom Tierney and co can do now is play one match at a time. I’ve known for a while that ‘real life’ was going to get in the way of my attending these matches so I have come to accept it, but by all accounts it seems to have been a cracking atmosphere at the UCD bowl. Full house, making loads of noise, and for the most part a great occasion for all. Fair play to eir Sport for taking on the task of televising the majority of matches - luckily for me I switched to them in February [no, I'm not being sponsored I'm merely being honest] though at least our national broadcaster found the time in their schedule to show the Irish matches. Were I to have one qualm with the presentation on the night it would be with the playing of Ireland’s anthem. Now I’m not as opposed to 'Ireland's Call' as many seem to be but it is definitely a tune that can be performed badly and I was very surprised to see the organisers resort to the 'diddly aye' version as opposed to a band or at least something more rousing. It sounded like something you'd hear on an away ground where the organisers had to Google for a recording about an hour before kickoff. Possibly a World Rugby call rather than an IRFU/organising committee one, but disappointing nonetheless given we're the hosts.